I FINISHED THE BOULDER IRONMAN!!!!!!!!!!!!!!!!!!!!!!!!!!!!! I am still telling this to myself over and over today because I still don’t believe it, and I still look at an Ironman as an insurmountable feat even though I just did one yesterday. I think it’s going to take a while for the gravity of what I just accomplished to sink in, and for me to believe it actually happened… It was just a crazy and amazing day, and I hope you enjoyed the updates Sasha was posting on my Facebook page all day, but I also wanted to share my written perspective of the experience because I think there are many lessons about life woven into my day yesterday. I was up at 3:00 AM to eat because it always take me a while to choke down my breakfast and we needed to leave between 3:45 – 4:00 AM to catch the shuttle to the reservoir. Per my usual on race morning, I ate my breakfast and promptly threw half of it back up. This is standard procedure for me on race morning and I always feel a million times better once it happens, so I rolled with it and took it as a good sign that my body was pumped for the day. We got to the reservoir and made our final preparations for transitions and walked through which leg would be where at what point in the race and how Sasha would assist me in changing legs for each phase. Once we had that all worked out, we headed over to the swim start so I could get into my wetsuit in time for the 6:10 AM start. I drank a quick nutrition mix to make up for throwing my breakfast and then just relaxed by the swim start for a bit to calm the nerves. I was not as nervous as I expected, but was more excited than anything else. The day I’ve been looking forward to since I signed up for Ironman last September had finally arrived. I truly did feel like a kid on Christmas morning. 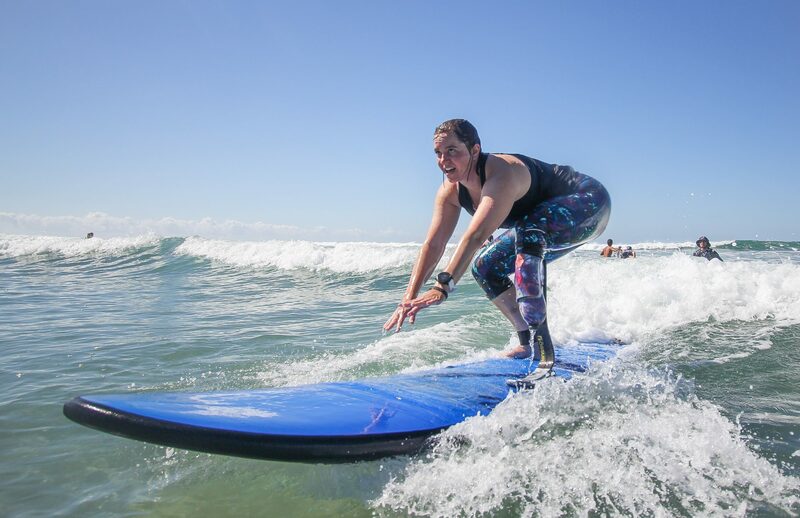 The PC (physically challenged) athletes get to start at the back of the wave with the female pros, so that is pretty dang cool. We all got in the water and next thing I know it’s 1 minute to go, 30 seconds to go, and BANG!, the cannon goes off and we’re all off into the water. I always get excited at the beginning of the swim because it’s my favorite part of the whole day, and it’s hard for me to hold back. However, my Coach and I had talked about being smart and not pushing myself in the water because it was going to be a long day and it wasn’t worth shaving 5 seconds per 100 meter off my time. I got into a great rhythm and just kept going from buoy to buoy at a steady pace I knew I could maintain without gassing myself. It took until the first turn about 1/3 of the way through the swim before I started getting passed by the fastest age groupers, so I had a lot of time to just swim in the open water basically by myself. I only freaked out and thought I was being attacked by sea monsters a few times when some water plant latched onto my arm, but I kept my cool and shook it off and kept swimming. I came out of the water around an hour and 23 minutes, which was right on pace for my day’s goals. Sasha helped me get to my towel, strip my wetsuit, and throw on my running leg so I could go through the changing tent to get ready for the bike. I was in heaven because my day was, to this point, going just as planned. In the first transition, Sasha and a volunteer helped me get out of my swim gear and changed into my bike gear. I had gone back on forth as to whether to wear tri bottoms or my bike skirt from Skirt Sports and ultimately decided on the skirt, throwing any judgement of others regarding my choice out the window because that skirt is ridiculously comfortable and 112 miles is a long time on the bike. I saw one other lady in a skirt out on the bike, so we were basically beauty queens out there, haha. After changing, I ran to my bike where my bike leg was waiting, switched legs, and ran out of transition to start the bike. My plan on the bike was to stay steady, maintain a 14-15 mph average, and finish in 8 hours or less – a major part of this was making sure I didn’t push too hard and completely destroy my legs before the run. All was going well until mile 24 of 112 when my Di2 electronic shifters decided that despite fully charging them on Thursday, they were going to attempt to sabotage my day by refusing to work… at all. (I found out later that a wire in my seat post had gotten a kink it in and that’s why it stopped working.) For those of you not familiar with bikes, this means I could not shift into a different gear in the front or back and was stuck in the gear I was in when they quit for the day. What gear was I in, you ask? Well, the big ring in the front and the 3rd ring down in the back – this is a great gear for flats and slight downhills. It is not good for going uphill, especially not big hills like some of those on the course yesterday. As soon as I realized what was happening, I had a flash of an idea to quit, but kept riding (I was going downhill) and thought about a story Nicole DeBoom told about being in a race when her saddle broke and she freakin’ made it work to finish the race. It took A LOT of self-talk to get myself through the next 32 miles when I reached the halfway point, and I’m sure some of the people passing me thought I was crazy for not shifting and because I was talking to myself out loud to get through it (C’mon Emily, you can’t quit now; Woman up, Emily, you can freakin’ do this; stupid bike, you aren’t going to sabotage me today, I am going to do this race whether you like it or not… and so on). At the halfway point, I saw Sash and Coach Mark and had a brief meltdown about my situation, but they encouraged me to keep going AND SO I KEPT GOING. I had made the decision towards the end of the bike that I would speed walk the first couple miles in my walking leg in order to give my body a chance to cool down and reset. Unfortunately, I forgot to bring my left running shoe for my walking leg because I never need a left shoe when I’m running… GAH! Sasha to the rescue, though, because we were able to swap out some shoes so I could have shoes to walk in for the first couple miles. I got all changed into my running gear and off we went out of T2 and onto the run. Because of what happened on the bike, the run was a matter of survival and finishing within the 17 hour cutoff. I walked the first few miles with Sasha, and then switched to my running leg so we could maintain a run/walk alternating pattern. At this point it was still blazing hot, so we were thankful for ice down the bra and socks full of ice to put around our necks. Sasha, who is a saint, carried my extra legs in a backpack as we did a run/walk and ended up getting a big knot in her neck because of it. I honestly don’t know what I’d do without her! We finally got into town and onto the creek path and Sasha stayed put in a spot where I’d pass again later as I went on by myself. I continued to run/walk as quickly as I could get my legs to move forward and just kept going. At one of the aid stations, a bunch of my Skirt Sisters were there and as soon as one saw me there was a chorus of “EMILY!” and “GO EMILY!” It was such a boost for me when I needed it most!! Then, soon after, some of my amazing coworkers were stationed along the trail and they, too, cheered for me and boosted my spirits at a much needed time. Lucky for me, I got to run out and back and past post of these crews again – what a gift to have such amazing friends out there on a brutally hot day!! Somewhere between miles 13-15, I started running with a guy named Steve who I had been leap frogging with for a little while. He was seriously a gift from the triathlon gods yesterday, and once he and I started running together we really pushed each other to jog as much as possible, and even more than I think either of us wanted or thought was possible. Steve even picked up his pace because I needed to get to the finish earlier than him because he had started in a later wave than me and so his cutoff was later in the evening. Given how close it eventually came to the end, I don’t know that I would have made the cutoff had I not started running with my newfound friend Steve. Somewhere around 1/4 of a mile from the finish I found out that I would have to sprint in order to make the cutoff due to a chain of magical & unlikely circumstances, so I dug into the deepest depths of my soul, cursed my bike and told it that it was not going to rule or ruin my day, and freakin’ sprinted my heart out. I ditched my plan to high five all the spectators at the finish line and pause for a double thumb’s up photo and instead sprinted rudely right past Mike Reilly without even noticing he was there (I only realized it after I watched the finish line video), and basically fell into Sasha’s arms as I crossed the finish line with only 48 seconds to spare. We can’t believe was just happened over the last 17 hours!!! Scott Rigsby was there at the finish to give me my medal (which is pretty cool because he was the first bilateral amputee to finish the Kona Ironman Championships) and I was helped over to a chair so I could take off my leg – FINALLY SOME RELIEF! I will spare you the pictures of my leg right now, but it is not pretty. I am so thankful for all the people who were there at the finish to help take care of me. I was taken to the medical tent to get an ace bandage for my leg and I told the doctor that I ran so hard my leg fell off – he said that was the funniest thing he’d heard all night. After getting ice and a wrap, I sat on a bench with Sasha and Coach Mark and we were all just in disbelief about the whole day. Coach Mark said it was the craziest race he’s ever seen, and I think he was even a little speechless at times about all that had happened and the fact that I somehow pulled it out of the depths of my soul to make it to the finish in time. My entire day of 16 hours, 59 minutes, and 12 seconds came right down to the wire. This was not how it was supposed to be because I should have comfortably been in the 15:30-16:30 range (not almost 17:00!! ), but the day had other plans in store for me and despite all of it I still finished within the cutoff all because I persevered through the heat and the mechanical issues on my bike, and ultimately found my running angel, Steve. I truly could not have done this Ironman without my team. I know triathlon is technically an individual sport, but I believe it really does take a whole team to make it all happen. Mark’s coaching and support over the past 4 years has been invaluable, and he has helped me to become a smart athlete with the ability to be flexible on race day and make it happen when everything goes to hell in a handbasket rather than quitting. Sasha’s willingness to sacrifice her neck muscles to carry my legs is just not something you’ll find in many people, and she is a huge part of my success yesterday. Zach had some misfortune in his race yesterday, but he did not dwell on that and celebrated whole-heartedly with me when I finished. We have trained separately but in support of each other, and for that I am so thankful. My friends and family have always supported and encouraged me, and that has helped carry me through my training when it got tough, as well as seeing some of them out on the course yesterday cheering for me. My Skirt Sisters have provided me with power boosts at an unimaginable level, and even yesterday they were there on the course when I needed them most, from the aid station to other friends out on the course cheering for me. I am also grateful for my supporters who I have not had the chance to meet in person, but who have followed my story on social media – your encouragement to share my story has been so powerful. From the bottom of my heart, thank you to everyone who has followed and supported my journey to Ironman. I am so happy to have earned the title of being an Ironman with only 48 seconds to spare. I’m sure there will be another adventure on my horizon, but for now I am going to bask in the glory of actually accomplishing this behemoth goal. Congratulations! I think all triathletes are pretty amazing, but to finish with the obstacles that came your way is so inspiring! No, I won’t be doing a triathlon, but you inspire me to push harder at those things I will be doing. I loved “watching” your race through the photos from Skirt sisters yesterday. You rocked it! This is so awesome! I loved following along and reading your report – what an amazing feat! Enjoy basking in this accomplishment! Oh my goodness, Emily! I had caught the gist of your story on social media but reading it all…so incredible! SNIFF. You are amazing and I am going to carry your story with me to think about when I get into a tough spot. Thank you for sharing! Congrats, Emily! You amaze me.Your mental strength must be incredible to keep riding without your gears! Emily, you are freakin’ amazing in every way. Love you sister.